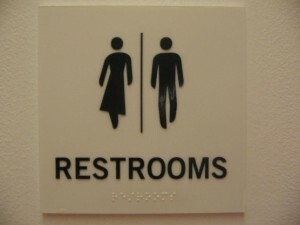 Edward Zimmerman at FoodService.com has written a great post titled: Clean Restaurants Build Customers’ Confidence. It is worth the 1-2 minutes to read. He makes the point that the cleanliness of your restaurant dining area (and washrooms) are a reflection of a restaurant’s kitchen cleanliness. Zimmerman goes on to give some very specific (and helpful) ideas on how to improve the cleanliness of your restaurant as well. Create your own Comment Box for free. This is what your customers will see on their phone. It’s a good read — we’d like to add another idea on how you can help insure that the cleanliness of your restaurant is kept to a high standard. Zimmerman mentions “Clean bathrooms might be the most important marketing job in your restaurant.” Our customer feedback tool Comment Box is perfect for this marketing effort. Use Comment Box as a listening post to get direct, private customer feedback on your restroom. 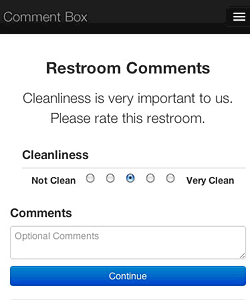 You can set up a simple, one question Comment Box by asking your customer to give “Restroom Cleanliness” a rating out of 5 (see example to the right). The customer can also leave comments as well. Most times, they do. The benefit to you is that the customer’s comments and rating get sent instantly to you (the manager or owner). You can then take immediate action to correct any issue. Comment Box is easy to set up. All you need is an email address and you are ready to go. You can sign up for a free account here and have your Comment Box ready to receive comments in minutes.